The Melrose Recycling Committee sent the below letter to the Department of Planning and Community Development in February to express the committee’s interest in improving the solid waste and recycling needs of our community’s parks and open spaces. The Melrose Recycling Committee reviewed the Draft Open Space and Recreation Plan. While the plan proposes many valuable strategies and actions, the solid waste and recycling needs of our community’s parks and open spaces require greater attention in the plan. Melrose undertook significant investments in the last ten years to improve recreational facilities. Much of what is proposed in the new plan addresses the need to maintain the quality of what’s been built and conserved to date. Melrose has made a commitment to sustainability; recycling is a critical component of any sustainability strategy. The implementation of single stream, weekly curbside pickup are helping residents to recycle more at home. The commitment to recycling needs to be extended to public spaces. People consume thousands of items in disposable packaging every year in our parks and open spaces, including many plastic bottles. Most of our parks and open spaces do not have recycling receptacles. In those that do, we can improve the convenience and onsite signage to increase the recycling rate. Litter is also a critically important issue to address in the Plan. Without a more aggressive plan to promote recycling and waste disposal, the amount of trash littering our parks and open spaces will continue to build up and become a permanent part of the ecosystem. The 2015 Day of Service, held on Martin Luther King, Junior Day provided a timely opportunity to see the impact of improper waste disposal on our open spaces and parks. A group of 20 volunteers—many from the Melrose Recycling Committee—spent several hours cleaning up litter around Ell Pond including at the Gazebo, the Crystal Street tennis courts, and the Knoll. We collected 38 bags of trash and recyclables in just a few hours. While much litter was removed, we left behind thousands of bits of trash (much of it plastics) that were simply too small or too embedded to remove. Over time, Ell Pond’s water and soil will be composed increasingly of plastic. A plan to promote sustainability and a healthy community must address the pollution caused by improper waste disposal. Provide easy access to trash and recycling receptacles in all parks and major open spaces. Ensure recycling receptacles are conveniently placed, clearly designated for recycling (not trash) and include features to prevent trash disposal with recycling. Communicate effectively to users of parks and open space about proper waste disposal through signage in the parks and open spaces, as well as other communication channels (e.g., Parks Department communications, etc.). Work with all users of the parks and open spaces to promote compliance with proper trash disposal and recycling. We recommend permitted use of parks and recreation facilities be contingent on proper waste disposal. Specifically, permits should require a “security deposit” to ensure facilities are left in good condition, users clean up after themselves, etc. Make the provision of trash and recycling receptacles a requirement for future projects; projects should not be approved and funded unless this requirement is met. Moving forward, the Melrose Recycling Committee is available to work with the city to evaluate and implement solutions that will increase recycling and decrease litter in our public spaces. We look forward to reviewing the revised Open Space and Recreation Plan, and working in partnership with the city to accomplish these important goals. Melrose Department of Public Works will hold a Styrofoam recycling event on Saturday, March 21 at the DPW Recycling Center at 72 Tremont Street from 8:00 a.m.to 12:00 p.m. This event enables residents to recycle Styrofoam, which is a difficult product to recycle and cannot be placed in curbside recycling. 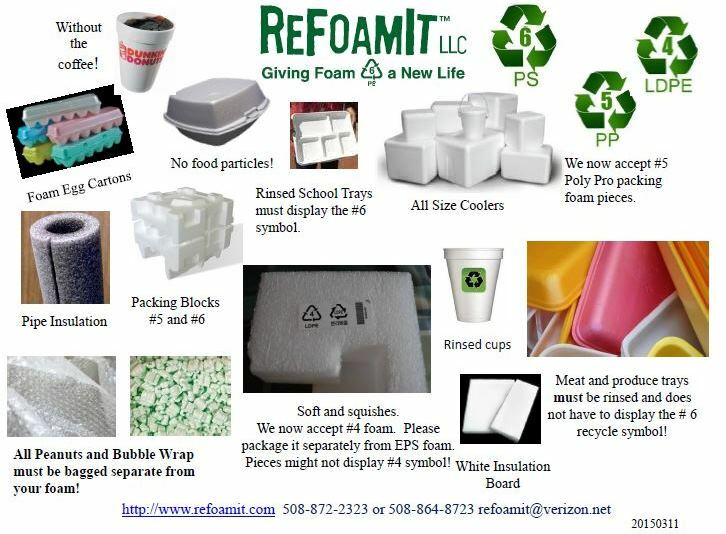 ReFoamIt will collect the Styrofoam to be recycled. Some of the items that will be accepted include: packing blocks, produce and meat trays, take out containers, hot cups from stores such as Dunkin’ Donuts and Honey Dew Donuts, and foam egg cartons. Most items need to have the recycling symbol on them. Visitwww.refoamit.com for a full list of acceptable items. This is a free event and open to Melrose and Stoneham residents. The items collected at all Saturday recycling events include: CRTs including TVs, monitors and lap tops ($10-$15), electronics, CFL bulbs, books, clothes, tires ($2-$8), mercury items, dried latex paint and metal items ($20) including microwaves, air conditioners, refrigerators, sofa beds, recliners, and exercise equipment. Recycling Center stickers and recycling barrel label stickers will also be available.